John previously was part owner of AZ Fly Fishing. A long time Arizonan, he has been fishing Arizona’s waters for over 45 years. He is currently actively involved and serves as the president of a new non profit organization, the White Mountain Lakes Foundation. This foundation was formed for the sole purpose of improving the trout fishing waters of the White Mountains of Arizona. His knowledge of the state’s cold and warm water fisheries has proven helpful to many fishers that seek advice on our local fishing. 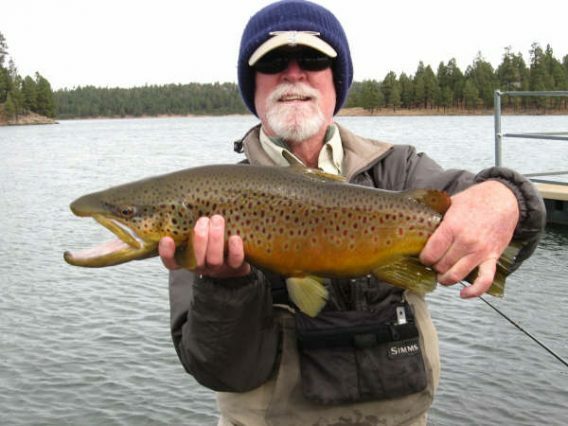 His book, AZ Trout Streams and their Hatches, which he co-wrote with Charles Meck, has been a guideline for beginner and advanced fishers plying our waters for trout. He has been in the flyfishing industry since 1983 either as a contract tyer, a guide, a shop owner or now as a fly designer and fulltime manufacturer of fly tying materials. A contract tyer for Riverborn Flies, his flies and materials are sold all over the world and are some of the more popular flies used in Arizona’s bass and trout waters. John now runs an online retail business selling his flies and materials at www.azflyfishing.net. You can reach him by e mailing him at that site. He is more than happy to talk fishing and flies any time.